The NFL star-turned-activist has been making headlines for months as the spearhead of take-the-knee protests against police brutality. But something many don't know about Kaepernick is that he’s vegan. 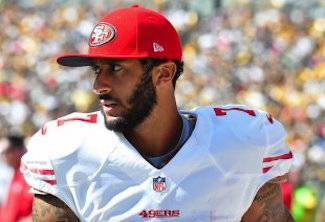 Last week GQ announced Colin Kaepernick as its Citizen of the Year with the headline, “Colin Kaepernick Will Not Be Silenced.” The NFL star-turned-activist has been making headlines for months as the spearhead of take-the-knee protests against police brutality. But something many don't know about Kaepernick is that he’s vegan. By going vegan in early 2017, the athlete made clear he would not be silent about the oppression of nonhumans either. Because the factory farming industry values profit over all else, by going vegan you’re standing up not only for animal welfare, but for other social justice issues, including racial equality and the rights of immigrants and workers. The connection between animal agriculture and racial discrimination is real. Populations near factory farms tend to be poor communities or communities of color. These farms pollute the surrounding areas so much that residents suffer a host of illnesses from breathing in the many harmful gases these facilities emit. A 2002 study examined more than 60 factory farms in Mississippi and found that the majority were located in poor areas with a high percentage of African Americans. Similarly, a 2005 study found that in North Carolina poor communities had seven times more hog farms than affluent areas and that communities of color had more than five times as many hog farms as predominantly white communities. Countless reports have highlighted the dangerous and unsanitary conditions workers face at factory farms and slaughterhouses. From being subjected to many workplace hazards to being denied breaks, workers are often mistreated and exploited. They commonly sustain severe injuries and sometimes suffer from respiratory illnesses and infections by antibiotic-resistant bacteria. In addition to posing physical dangers, the work at factory farms and slaughterhouses often leads to psychological trauma. According to PTSD Journal, many factory farm and slaughterhouse workers must emotionally disconnect from their work to cope with the daily abuse and killing of animals. This emotional dissonance often leads to domestic violence, social withdrawal, anxiety, drug and alcohol abuse, and PTSD. With an unknown percentage of full- and part-time undocumented immigrants working in the industry, Big Ag preys on vulnerable people. In fact, 93 percent of dairy workers in New York are undocumented immigrants. Many undocumented workers are afraid to go off the farm for fear of being caught and deported, a fear reinforced by demeaning or intimidating comments from their supervisors. Some remain on the farms for more than 11 days at a time. Cows, pigs, and chickens raised and killed for food are just as smart and sensitive as the dogs and cats we adore at home. But at factory farms, animals are subjected to unimaginable cruelties: intensive confinement, agonizing mutilations, and violent deaths. As someone who truly cares about the rights of all and has dedicated his life to fighting oppression, Colin Kaepernick is more than deserving of GQ’s title. Want to be as woke as Kaepernick? Take on the factory farming industry, one of the worst perpetrators of systematic oppression, by choosing to leave animal products off your plate. Get started today. Joe Loria is the communications and content manager at Mercy For Animals.